The 1948 Indian Chief motorcycle was and remains a classic American chopper. With the trademark skirted fenders and gold trim, this bad boy was king of the road. A vintage motorcycle collector with a 1948 Indian Chief is a collector with bragging rights. The Chief done up in black and chrome was the prototypical mid-20th century American chopper. The 1948 Chief had the throttle on the right hand side, a foot clutch, and left hand shifter. It took coordination to master maneuvering one of these, but once mastered, this was one amazing ride, from the tales of those who have been there. This was one of those bikes that you’d hear before you saw it, with its low, thundering sound. It had a 1,200 cc (74 cubic inch) flat head engine, and was sadly Indian’s last attempt to save the company from the troubles it experienced after World War II. Though Indian went out of business in 1953, the 1948 Chief had the style, power, and technology to be the finest motorcycle in the world for the time. The 40s were not an easy decade for the Indian Motorcycle Company. The first part of the decade was spent making bikes for the war effort and making and repairing bikes for the numerous police departments that used Indian motorcycles. Their effort during World War II was almost heroic, but after the war was over, they had trouble getting their land legs back again. The Indian motorcycles made for consumers during the 1940s had the iconic deeply skirted fenders and classic Indian style. But in 1945 the company was sold and became part of the Torque Engineering Company. A few years later, the company was split in two, with manufacturing becoming part of the Atlas Corporation and distribution going to the Indian Sales Corporation. This proved to be a historical event too, but the depth of the troubles was not yet completely evident in 1948. Not only was the 1948 Chief a classic, but the Indian Scout was still – nearly 30 years after its debut – winning races. Another impressive victory was the 1948 victory in the Daytona 200 by Floyd Emde riding a factory constructed Indian 648. He held the lead from the beginning and never gave it up, setting a new course record speed of over 84 miles per hour. 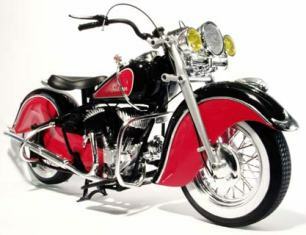 1948 was, to borrow from Dickens, the best of times and the worst of times for Indian Motorcycle. Everyone could see that they knew how to make amazing bikes, but the business decisions after the end of World War II would eventually be more than the brand could overcome.